An analysis of 2 million-year-old bones found in South Africa offers the most powerful case so far in identifying the transitional figure that came before modern humans - findings some are calling a potential game-changer in understanding evolution. The bones are from Australopithecus sediba. The research places that pre-human branch of the evolutionary tree as the best candidate to be the ancestor of the human line, said Lee R. Berger of the University of Witwatersrand in South Africa. The bones, found in 2008 in the fossil-rich cave region of Malapa near Johannesburg, show a head-to-foot combination of features of Australopithecus and the human genus, Homo. "It's as if evolution is caught in one vital moment, a stop-action snapshot of evolution in action," said Richard Potts, director of the human origins program at the Smithsonian Institution. He was not among the international research team, led by South African scientists. Their research was published online Thursday in the journal Science. Scientists have long considered the Australopithecus family, which includes the famous fossil Lucy, to be a primitive candidate for a human ancestor. The new research establishes a creature that combines features of both groups. The journal published five papers detailing the findings, including separate reports on the foot, hand, pelvis and brain of A. sediba. Berger said the brain, hand and foot have characteristics of both modern and early pre-human forms that show a transition under way. It represents a bona fide model that could lead to the genus Homo, Berger said. Kristian J. Carlson, also at Witwatersrand, said the brain of A. sediba is small, like that of a chimpanzee, but with a configuration more human, particularly with an expansion behind and above the eyes. This seems to be evidence that the brain was reorganizing along more modern lines before it began its expansion to the current larger size, Carlson said in a teleconference. "It will take a lot of scrutiny of the papers and of the fossils by more and more researchers over the coming months and years, but these analyses could well be `game-changers' in understanding human evolution," according to the Smithsonian's Potts. So, does all this mean A. sediba was the "missing link"? Well, scientists don't like that term, which Berger calls "biologically unsound." This is a good candidate to represent the evolution of humans, he said, but the earliest definitive example of Homo is 150,000 to 200,000 years younger. Scientists prefer the terms "transition form" or "intermediary form," said Darryl J. DeRuiter of Texas A&M University. "This is what evolutionary theory would predict, this mixture of Australopithecene and Homo," DeRuiter said. "It's strong confirmation of evolutionary theory." But it's not yet an example of the genus Homo, he said, though it could have led to several early human forms including Homo habilis, Homo rudolfensis or Homo erectus - all considered early distant cousins to man, Homo sapiens. These articles "force a rethinking of how traits are coupled together in human evolution," the Smithsonian's Potts said in an email from Kenya, where he is doing research. "For example, in previous definitions of our genus, the leading edge in the emergence of Homo has been brain enlargement. The sediba bones show, however, that reorganization of the brain and pelvis typically connected with the evolution of Homo need not have involved brain enlargement," he noted. "The more we learn about human evolution, the more we see that traits" that must have happened together could occur separately, Potts said. The study of the hand shows that major changes in the thumb usually associated with stone toolmaking "did not imply abandoning life in the trees. In the foot article, we're introduced to a unique and previously unknown combination of archaic and advanced traits in sediba," Potts explained. 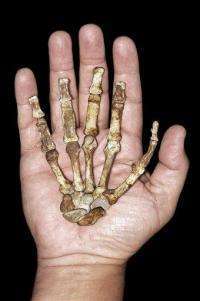 The fossil provides the first chance for researchers to evaluate the function of a full hand this old, said Tracy Kivell of the Max Planck Institute for Evolutionary Anthropology in Germany. Previously, hand bones older than Neanderthals have been isolated pieces rather that full sets. The researchers reported that the fingers of A. sediba were curved, as might be seen in a creature that climbed in trees. But they were also slim and the thumb was long, more like a Homo thumb, so the hand was potentially capable of using tools. No tools were found at the site, however. The heel bone seems primitive, the researchers said. Yet its front is angled, suggesting an arched foot for walking on the ground, and there is a large attachment for an Achilles tendon as in modern humans, they said. The pelvis is short and broad like a human pelvis, creating more of a bowl shape than in earlier Australopith fossils like the famous Lucy, explained Job Kibii of the University of the Witwatersrand. That find may force a re-evaluation of the process of evolution because many researchers had previously associated development of a human-like pelvis with enlargement of the brain, but in A. sediba the brain was still small. The subjects of the research were the bones of an adult female and a child. After the discovery, the children of South Africa were invited to name the child, which they called "Karabo," meaning "answer" in the local Tswana language. The older skeleton has not yet been given a nickname, Berger said. The juvenile would have been aged 10 to 13 in terms of human development; the female was in her 20s and there are indications that she may have given birth once. The researchers are not sure if the two were related. inb4 evolution is a lie.. There's that fossil record you guys keep saying doesn't exist. Actually, they'll probably say that now there's two gaps in the fossil record (before and after this new fossil), where there was only one. Either that, or this is yet another example of the infinite wisdom of the deity, planting such specious fossils, at such cloyingly telling geological depths, with such overwhelmingly convincing scientific signs pointing to evolution, all to test the flock's faith in the particular writings that were arbitrarily deemed to be "the bible". Now how about relating A. Sediba to later species. Looks like a smallish type hominid, as would expect from maybe a tree dweller. SA is not that heavily forested now, but maybe in the remote past it was better watered. Trees, lots of them, would be important to a tree dweller. Probably an omnivore. Millions of years in the making yet only advanced in the last ten thousand to thirteen thousand years, with most of that coming in the last severeal hundred years. Think we had help at least twice. This does not give comfort to those that would deny devine creation, as God in his turn is supreme in the Universe, created the first life where ever that happened, and if those in whichever turn engineered us by including some of their in however turn devinely created genes, it is also God's doing as He created them. In our multiverse there IS room for God. "Actually, they'll probably say that now there's two gaps in the fossil record (before and after this new fossil), where there was only one." Exactly... until creationists are presented with a series of many many thousands of skeletons that show a gradual change between each one then it's like talking to a brick wall. Unfortunately that won't ever happen because fossils are rather a rare thing in the scheme of things. Which leads onto the next problem... many creationists think fossils happen all the time. Sigh. Umm... What's the Tswana word for "question"? "question" in tswana is "potso"
Damn skultch - you could probably be a little more up front with the sarcasm. I was diving in with the one rating and finally came across your last sentence. Nearly missed it. Not everyone on this site fully reads the comments, and sadly, for reasons beyond my comprehension, a serious comment like yours is not that uncommon on this site. Damn skultch - you could probably be a little more up front with the sarcasm. I don't really care about the 1s. I just want to push some buttons so maybe the creationists, in anger, will finally divulge their true opinions and perspective instead of cowardly hiding behind their pseudo-science. I truly want to understand the significant details of their psychosis. The quality of my worldview would benefit from such an explanation. I truly want to understand the significant details of their psychosis. The quality of my worldview would benefit from such an explanation. I suspect it is deeply rooted in the human desire for certainty. Humanity's greatest asset is our thirst for answers to the unknown, yet our greatest flaw is our preference for the Ignorance of Certainty when faced with the unknowable. I choose the certainty of ignorance over the ignorance of certainty, but I know that that is not a palatable option for a great deal of my species.